While Kinder Morgan's (NYSE: KMI) share price declined again in 2018, it was still an outstanding year for the pipeline giant. The company's management team hammered this point home on the fourth-quarter conference call, where it laid out the numbers showing that the company outperformed its targets on every level. Here are four of the most impressive ones for the year. 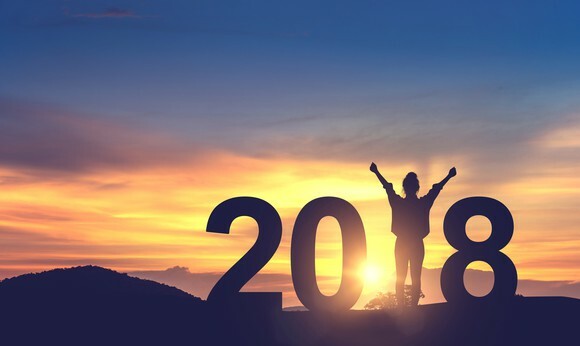 Heading into 2018, Kinder Morgan estimated that it would generate $4.57 billion of distributable cash flow (DCF), or $2.05 per share, which would have been about 3% higher than the previous year. However, the company would go on to produce $4.73 billion, or $2.12 per share, in DCF last year. That outperformance came even though the company sold its Trans Mountain Pipeline in Canada and felt some impact from the crash in oil prices late in the year. 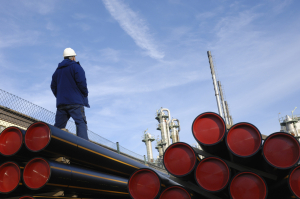 It was able to more than offset those two headwinds by delivering strong performance in its natural gas pipeline business, where volumes surged thanks to healthy production and demand growth. After spending the previous few years selling assets to help pay down debt, Kinder Morgan ended 2017 within striking distance of its targeted leverage ratio of 5 times debt-to-EBITDA. Given the anticipated earnings growth for 2018, Kinder Morgan estimated that it would end the year with a leverage ratio of around 5.1, which would enable it to maintain a solid investment-grade rating. However, after selling Trans Mountain, the company applied the entire proceeds toward paying off debt. The decision helped push the company's total debt reduction since late 2015 to $8 billion, which resulted in its ending the year with a 4.5 leverage ratio. That led two rating agencies to upgrade the company's credit rating one notch further into investment-grade territory, while the company expects a third one to follow suit in 2019. Because Kinder Morgan largely achieved its leverage target in 2017, the company planned to return more cash to shareholders in 2018, mainly through a 60% dividend increase, which it declared following the first quarter. However, the company noted that after paying that higher dividend as well as fully financing its expected $2.2 billion capital budget that it should have roughly $500 million to spare, which it could reinvest in more high-return expansion projects or buy back stock. As it would turn out, the company did both, repurchasing a total of about $275 million in stock during the course of the year. That brought the total cash returned to shareholders up to almost $1.9 billion. As noted, Kinder Morgan planned to invest $2.2 billion into expansion projects during 2018, led by the Elba LNG export project and the Gulf Coast Express Pipeline. However, actual investment spending came in at $2.57 billion after the company sanctioned new projects during the year, including the Permian Highway Pipeline. Those additional projects have Kinder Morgan on track to invest even more money in 2019. Currently, the company estimates that it will spend $3.1 billion on expansions this year as it finishes up work on both Elba and Gulf Coast Express while also continuing to build others, such as Permian Highway. Meanwhile, the company has several more expansions in development that it could sanction this year, which could result in another increase in growth-focused spending. Kinder Morgan made more money, returned more cash to shareholders, paid off more debt, and invested in more expansion projects than it expected last year. Typically, results like that would have driven its stock higher. Instead, shares trade at an even cheaper valuation, making them quite a bargain in 2019. 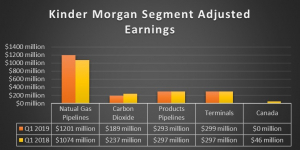 E How Will Kinder Morgan's Stock Move After Earnings?